Collectively we can tackle the biggest and most challenging issues in the workplace. Technology is shaping the future. Our collective humanity will determine how technology is used to shape the workplace. 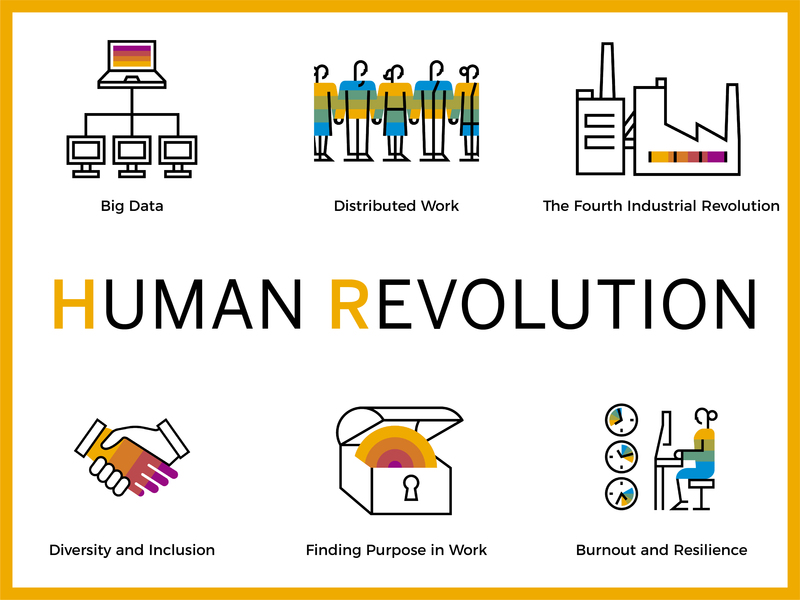 That’s why Thrive Global, SAP SuccessFactors and our communities are launching the Human Revolution, a set of attitudes and principles designed to help us tap into our collective humanity and learn how to connect with ourselves and each other in new and innovative ways. Collectively we will tackle the biggest and most challenging issues in the workplace. The fourth industrial age of hyper-connectedness, in which the Internet of Things meets the Smart Factory, promises to unlock more wealth than we’ve ever known. But realizing that promise won’t just be about machines – it will be about our ability to maximize the uniquely human skills of judgement, vision, intuition, wisdom, creativity, and resilience. Success in the Human Revolution will not be just about having access to big data — it will be about being able to utilize big data. That’s how we’ll make our businesses truly intelligent and resilient. Raw data is like crude oil – unable to be used to fuel and propel without being refined. And that refinement will be done not by machines, but by humans. Organizations will need people who can see across all functions, see around corners, anticipate change, and prime the workforce to take best advantage of it. As the world digitizes, power gets redistributed from the center outward to the entire system. This is true in media and politics, and it’s true in our organizations. This presents an opportunity: as people have more autonomy, they can collaborate more freely, solve problems quicker, and grow themselves and their careers faster. Managing the workforce of the past meant mitigating risk and doing damage control. Today the job is much bigger: it means creating an open, connected platform where people can operate with the freedom and confidence to tackle the biggest problems being faced by a company or an entire industry. Seizing the ever-increasing opportunities to use our creativity and judgment to the fullest is a steep challenge for people in all organizations and at every level. According to one survey, 96 percent of senior leaders report feeling burned out. And 87 percent of employees worldwide are not fully engaged at work. Our humanity is the solution, but only if we can spark purpose, motivation and inspiration, and learn to thrive by finding practical methods of renewal, recharging and resilience. Artificial Intelligence (AI) powered by data and analytics is an historic opportunity, but unless it’s managed correctly, it could also end up reinforcing historic biases within organizations. With the right tools, we can make AI a weapon against bias, insuring that the right people are matched with the right job, no matter what. Successful workplaces are moving beyond diversity to inclusion, creating an atmosphere in which collaborative work is strengthened by diversity, and all talents are utilized to their fullest. Employees and prospective recruits increasingly expect and even demand that the brands they work for stand for something beyond profits and quarterly earnings and align with their desire for purpose. This is especially true of Millennials, who will make up 75 percent of the workforce by the year 2025. Today, we are seeing unprecedented levels of innovation in HR technology. We believe this wave of innovation is at the heart of the Human Revolution, allowing businesses to focus time, talent and energy on what really matters: the people driving business outcomes. That’s why SAP SuccessFactors is bringing together organizations of all sizes, from enterprises to startups, to co-create “simple solutions to big problems” through purpose-built and easy-to-consume applications. This community is focused on tackling the most critical people issues facing HR professionals and business leaders today, including well-being, pay equity, unbiased recruiting, predictive performance, real-time feedback, internal mobility, and more. It takes all of us to innovate, shape, and build the future we want. Let’s build a community. Share your revolutionary story. The future of the workplace is all about people and putting a premium on their uniquely human skills: judgment, vision, wisdom, creativity, and resilience. This will allow us to connect with ourselves and each other in new ways. Another truth: revolutions start small. Here are a few stories of people leading the way in the Human Revolution. At Tapestry, the company is investing in its 22,000 employees while ensuring leadership understands the power of the human revolution that has taken the business world by storm.” Video. At American Airlines, a people-centric culture is being powered and the CEO has it at the top of his agenda. Video. This article was produced by Thrive Global and sponsored by SAP SuccessFactors.